Too many of today's supervisors, managers, and leaders are failing their staff and their organizations by "undermanaging." Falling victim to the empowerment craze of the last decade, they seem to have forgotten what it means to be the boss and are chronically undermanaging their employees. They do not take charge on the day-to-day business basics. They don't spell out expectations. They don't keep track of performance measurements. The don't correct mistakes or reward success. It's Okay to Be the Boss Facilitator s Guide offers consultants, trainers, and human resource professionals a hands-on guide for conducting a dynamic workshop that will give anyone who manages (from seasoned executives to new supervisors) the information they need to become a great boss who is highly engaged when leading, managing, and supervising their employees. Bruce Tulgan -- an expert in workplace issues -- explains the common obstacles to becoming an engaged manager and reveals which obstacles can be controlled and shows how to control them. Tulgan also offers effective strategies for working around obstacles that cannot be controlled. Manage everyday and conduct effective regular one-one-ones with direct reports and others. Talk like a performance coach and communicate clearly and effectively. Work effectively with each direct report individually and acknowledge their strengths and weaknesses. Create an environment that holds employees accountable. Make expectations of employees clear by telling people what to do and how to do it. Monitor, measure, and document employee performance. Solve small problems before they become big problems. 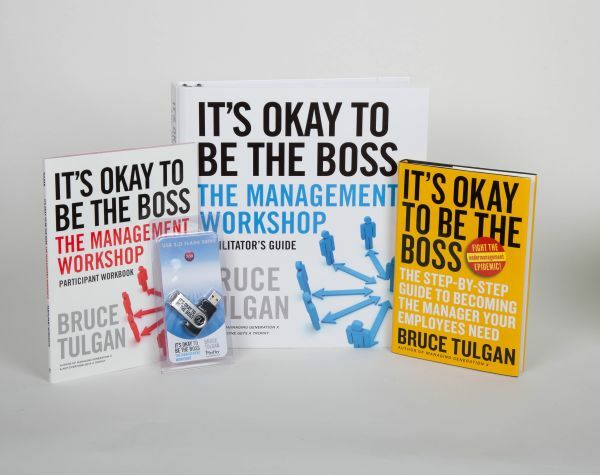 It's Okay to Be the Boss package contains everything you need to conduct a full-day workshop including a Facilitator's Guide, and introduction to the model, a script for training delivery, a PowerPoint slide deck, short instructional videos, and a sample Participant Workbook.